Did you know that men now make up 1/3 of all spa goers? At the Four Seasons Hotel - Hong Kong, men make up nearly half the spa's customers. (International Spa Association Reports) Refining spa treatments are becoming increasingly popular and some people will spend quite a bit of money on these treatments to help support healthy looking skin. Many of us live very busy lives and spa time just isn't easily scheduled, and we rarely even try to pamper ourselves at home. Young Living has created products that give us access to that "spa experience" without the high ticket cost or having to leave our homes. Today I'd like to talk a bit about *refining*. Refining products are formulated to target particular concerns. Masques are an important refining product that can be used to address specific skin concerns you have. Using a masque that doesn't have nasty chemicals in it - well, that can be tricky. But have no fear! Young Living has two products that will help us rest easy knowing that it is made with only the best ingredients! 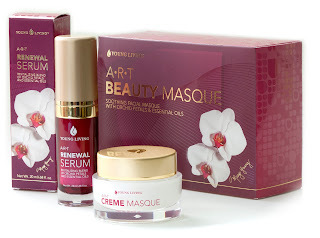 Young Living's ART Beauty Masque is formulated as a home-spa experience. 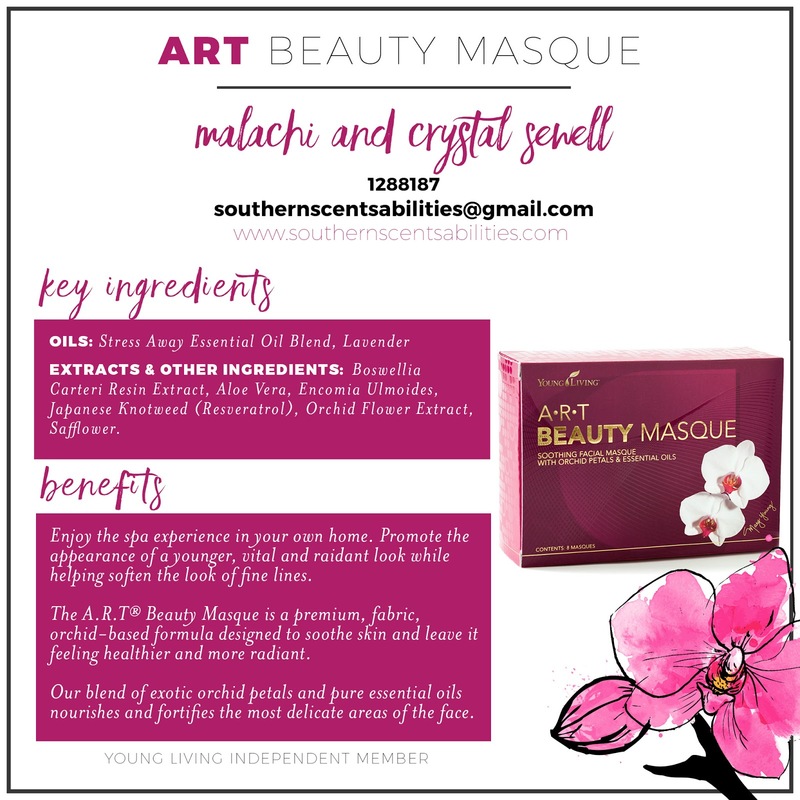 It is a pre-cut material that is saturated with proprietary blend of essential oils that deliver beautifying, effective benefits to all skin types. The masque has holes for your eyes, nose, and mouth and is peeled from a paper backing and put on the face. You can leave the masque on for 30-45 minutes, allowing all the nutrients and oils to be absorbed into the skin. Remove the masque and apply a small about of Young Living's ART Renewal Serum all over your face. The ART Beauty Masque has lovely ingredients of Stress Away Essential Oil Blend, Aloe Vera, Lactobacilus Ferment, Morus Alba, Phalaenopsis (Orchid Flower), Boswellia Extract, Angelica Sinensis. Young Living also offers a wonderful Creme' Masque. I personally love this one because I can apply it and go to bed, or apply it and get housework done and NO ONE knows I even have it on! This luxurious cream is ideal as a deep facial moisturizer or an all-night skin treatment. Once the masque dries, you can rinse it off. For best results, gently apply ART Renewal Serum over the face and neck once you've rinsed the masque off. Follow up with your favorite Young Living moisturizing cream. 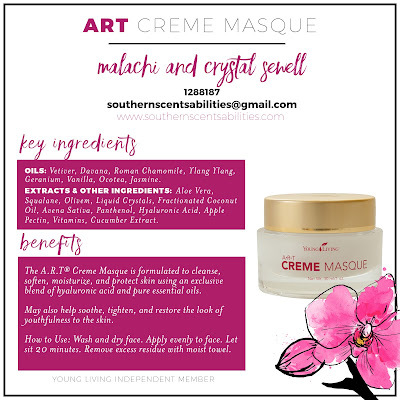 The Creme' Masque contains luxurious ingredients like Vetiver, Davana, Roman Chamomile, Ylang Ylang, Vanilla, Ocotea, and Jasmine Essential Oils, Squalane, Aloe Vera, Olivem, Avena Sativa, Sodium Hyaluronate, Camellia Oleifera Leaf, Cucumber Extract, and Vitamins. Either one of these refining masques would be great to add to your skin care routine. Next time I'll talk a bit about wrinkle and eye creams that Young Living has that help target specific areas on your face.